Freelancers face a lot of challenges in their day-to-day lives. 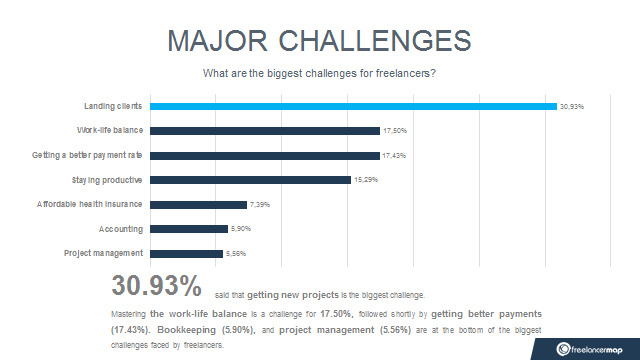 How do we know what our community on freelancermap.com finds difficult? It’s simple, we asked you! Activate former clients: To avoid always looking for new clients, make sure you build lasting relationships with the ones you are currently working with. Most successful freelancers get recurring jobs from the same client. Have a system: Coming up with a new way to approach clients each time you need a new project can really grind you down. Make sure your efforts are not wasted. Track the ways in which you approach clients and measure how successful they are. Once you figure out what works best for you, settle on a method and continuously refine it. By doing that, you’ll create a system that’s tailored for you and will keep getting you clients with minimal effort. Don’t give up and avoid slowing down: Persistence is key when acquiring clients. You don’t want to live project-to-project with periods of no contracts in between. Always be on the lookout and always follow your system. Having more projects means you can pick the best ones, too. Even when your plate is actually full – this is one of the rare circumstances where more is almost always better. More than one-sixth of our participants said they struggle with work-life balance. The actual number is probably even higher. Let’s be honest, nobody likes to admit that their personal life is suffering because of how much they’re working. At the beginning of your career, it can be very tempting to put your foot on the gas pedal and never ease up. But even if you love your job with all your heart – you need a break. Take it when opportunity arises. Don’t sacrifice your sleep. Be there for your friends and family. Burning yourself out after a couple of years of freelancing is the easiest way to make sure your career doesn’t go far. This is another classic freelancer struggle that everyone goes through at some point. About one in six of our participants said that increasing their pay rate is the biggest challenge they’re facing. And that’s harsh. You know you’re getting better every month, every year. You’re becoming a better businessperson by refining your current skills and learning new ones. And that should lead to earning more. In reality, however, many freelancer jobs are part of punishingly-competitive markets. That means there will be a lot of people trying to undercut your prices. The best way to combat that is to go against the flow. Avoid lowering your rates just because there are ten other freelancers in your niche who would do the job for less. Emphasize on quality. As freelancing keeps growing, many businesses realize that it’s not just about cheap and convenient external labor – it’s about getting experts. Strive to be one of those experts and make your payment reflect that. More than 15 percent of our survey participants say they struggle most with maintaining productivity. There are a lot of ways to fight your laziness. One of the things that works best for me personally is working in an environment with other people. That could be your local library, a co-working space or the coffee shop around the corner. The best way to figure out how you can maintain self-discipline is by trying different things out. If you see that things aren’t working out, break the mold. You’re not being productive in the mornings? Stop trying to work at those times altogether and focus on the evenings. You can’t get any work done because emails keep distracting you? Turn off your phone and the email client on your laptop. Identify what distracts you and cut it out as much as you possibly can. Eventually you will arrive at a place where you understand how and when you work best; utilize that knowledge to become more productive than ever before. What do you struggle with in working freelance? Share your thoughts with us in the comments below!